The movies, shows, and games that we share with our loved ones brighten up our most precious memories, and this solid wood TV stand - built by hand to your specifications - is the perfect way to enjoy them. 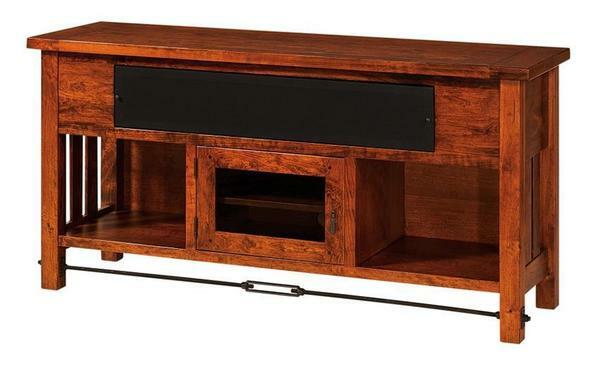 Crafted using traditional woodworking methods, this Mission-style TV stand promises year after year of beautiful, uninterrupted use. The classically tapered edges and eye-catching Mission details offer a level of style that ensures the Jordan will look just as delightful in a traditional home today as it will in 20 years' time. Additionally, this TV stand's clever design ensures that it's just as functional as it is pleasing to the eye. Three open spaces - two at each side and then one above - provide ideal homes for growing collections of media, consoles, and more, while the central shelf houses shelves behind remote-control-friendly smoked glass that offers protection without sacrificing convenience. Every piece of this remarkable TV stand is built by hand right here in the USA, promising you nothing but the best in home-grown quality and attention to detail. Use the menus above to create your ideal Jordan, and if you run into any questions - on stains, hardware, or anything in between - please don't hesitate to get in touch with us by phone or by email.